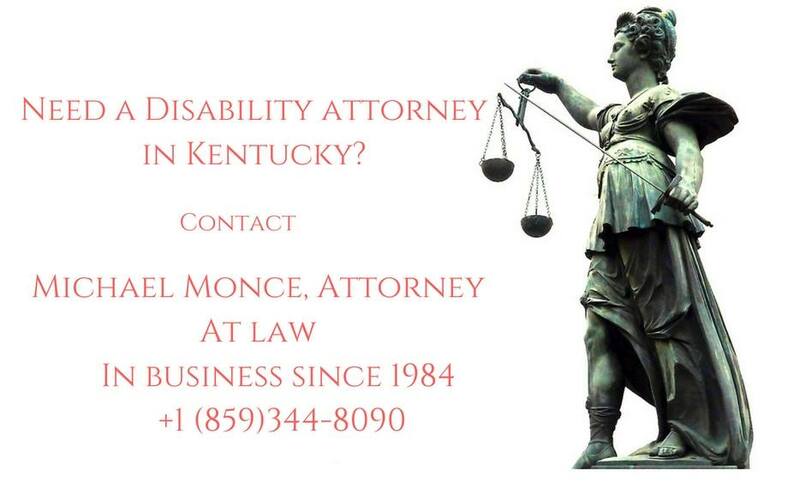 Law Firm of Michael Monce has legal expertise in the following areas like Social Security Disability Law, Long-Term Disability Law, Railroad Retirement Disability Law,Veterans Disability Benefits,Kentucky Worker’s Compensation Law. If you are unable to work because of a physical or mental impairment, you may qualify for Social Security Disability benefits or Supplemental Security Income. If you need help and are looking for an attorney experienced in practicing in the field of Social Security Disability law who can assist you in navigating the sometimes very complex process of applying for Social Security Disability benefits, then call the law-office of Michael Monce. We will assist you in your initial claim and at the reconsideration level, and we will also represent you at a hearing before an Administrative Law Judge if this becomes necessary. In addition, there is no charge for your first visit, and there also is no attorney fee unless your claim is allowed by the Social Security Administration for Social Security Disability benefits. If you need help and are looking for an experienced Social Security Disability Lawyer in Northern Kentucky or Ohio, who can assist you in navigating the sometimes very complex process of applying for Social Security Disability benefits, then call the law-office of Michael Monce. We will assist you in your initial claim and at the reconsideration level, and we will also represent you at a hearing before an Administrative Law Judge if this becomes necessary. Check out our Lawyers and Law firms’ directory section. We accept Guest post on wide range of legal topics.